On 8 to 10 November 2013 will be held in the Slovak city of Košice Women’s and Juniors European Futnet Championships 2013, where the best European women and junior teams together with Canada as a special guest of the tournament will be competing for the precious medals in three disciplines. 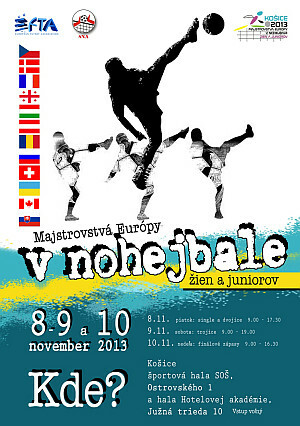 The championship is organised by the Slovak Futnet Association (SNA) under the auspices of the European governing body - European Futnet Association (EFTA) who will bring together the best players and their skills to ensure the unforgettable experience for all futnet fans as well as the participants. Good news for all those who would like to come to see the best female and junior players in Europe and cheer on their team - the entry during all the championships is free of charge!